Episode One is 15 minutes in length, has interviews, insights and flute sound clips from gorgeous repertoire and CDs, and deep flutey thoughts on practicing, warmups, and what it's like to LOVE sitting in the center of an orchestra. There are out-takes too. We really have fun, and, yes, it's a bit hilarious!!! Please go to the Fluteloops page, and download or stream the mp3 there (Any kind of media player will play a 13 MB mp3), and then tell me if you laughed and maybe even shed a nascent tear or two at the very end of the show. Nathan Zalman, a flute professor and performer and I had a great time making the show, and I really want feedback on how you enjoyed it. I did like the program, I was a bit put off at first, because of where you first advertised it. However, there is no doubt about your vast knowledge, insight, and wonderful giving personality. I loved the Galway segues (all of the seques as a matter of fact), and Rhonda Larson is just fabulous, so I will now have to purchase that CD. Also I could so relate to what you talked about in terms of practise. You just have to do it. The real connection came when you talked about crying during Firebird, as I have done that also. That as well as during that Elgar, the Shostakovich, Victory at Sea, and Rimsky-Korsakov (and a few others, but those come to mind). The way you described everyone taking that breath and the hearts beating, that only we hear on stage, and knowing the excitement or tranquility that is about to come. It is just a great moment. Especially when you all get through it beautifully. I don't think I've ever heard a program where they talked specifically about that adrelinine rush. Job well done. Dear Jen,I couldn't wait to hear your flute show as i so enjoyed the buzzing bees one and found it really helpful at the time. I have just finished listening to your new show and again it was just brilliant.Funnily enough I have just bought on line Dr Zalman's studies etc and am waiting for them to come through. I have downloaded your show on to my ipod as before, so will be able to listen to it again and again. I found it very inspiring and motivating, especially as I have recently changed teachers and am having to alter my embouchure quite a lot and play more rolled out.I have been feeling as though i have been going backwards. My first teacher who I loved was really a clarinet teacher and she has been wonderful at starting me from the beginning up to grade 6 ABRSM. She said that i had got too good and she could not teach me anymore and that I needed a specialist flute teacher. My new teacher is super too. She is principal flute player in the Bournemouth Symphony Orchestra.Your radio programme was just what I needed to encourage me to keep going. Thankyou so very very much!! Did you know I live in a small cabin in the middle of the rainforest? The fact that I can talk to people from all over the world, and laugh, and share, and talk about our passions, and our similar sobbing at various pieces (I wonder how many of us there are that sob at the same pieces?!) is just marvellous!!! Love to hear more from you. Feel free to discuss whatever you like, and send more ideas for future shows. Nathan emailed this morning and said he'd very much like to continue making shows like this, which is great, because we both laugh at the same things, and, like you and I, has discovered many of the same things about a life of practising and performing. The link to the Rhonda Larson website "Fruits of our Labours" on the main Fluteloops page has the added bonus of offering the sheetmusic for those pieces too!! They are all super marvy. She's a wonder for conceiving of them, and for publishing them too. I've been on a tear looking for more info on 'Moving On' of course you could only put up a small piece of it. I am definitely going to get the sheet music and CD, but what would it be graded? Sounds sort of like a (C+), maybe in the same vein as the Francaix Divertimento, or is it a little less challenging? How long is the total piece? Have you ever played it? It is simply beautiful, as is her playing. "Movin On" by Rhonda Larson is one tricky bit of playing. Of the six or more pieces offered on her website (also avail. 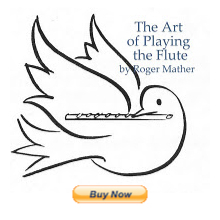 at www.fluteworld.com I believe) I would say that "Moving On" is the hardest. Parts of it just flow under the fingers, but others take weeks of work; esp. at the speed she plays it on her album!! Eeeek!!!! Very similar (and also able to be played with or without accomp.) is Lughnasa (sp?). It's VERY similar and alot easier. I would rate "Movin' On" as above grade 10 using the Canadian exam system (grades I to X, and then A.R.C.T. which is grade XI or XII!! ), and Lughnasa as grade 9/10. So if you don't want to have an apoplectic seizure, then try Lughnasa first. Thanks so much for your uplifting comment here. all the best, and keep us up on how your new lessons turn out. I found your website yesterday and have spent quite a bit of time here now! :-) Listened to your show, and I really enjoyed it. Your entire site is so friendly and helpful. What a great find! Thanks so much for your site. Can't wait to poke around more! I love to hear about folks taking the flute up again, and loving it as much as ever....that's part of the glory of playing music; it's always fabulous to re-immerse yourself! No matter how long you've been away. What a fun show. I loved hearing the interview and of course became emotional listening to the music. I would enjoy the program even more if you stated each piece playing and the performer. I have just written a book titled Music for Life: Making Music and Enriching Lives which has ideas from how to start a lucrative studio, to how to inspire students and yourself. Music for Life is published by Indiana University Press and will be available in July. It would be fun to talk to you sometime and share ideas about teaching.